2017 was a year full of growth! We are proud to share our accomplishments, such as launching a summer Computer Science Academy, serving more students than ever before, and sending 100% of the graduates of the class of 2017 to college! The theme of our 2017 report is "Community," and we've highlighted the many important pillars of our community who make our work possible. Read profiles of tutors, teachers, students, volunteers, and alumni. 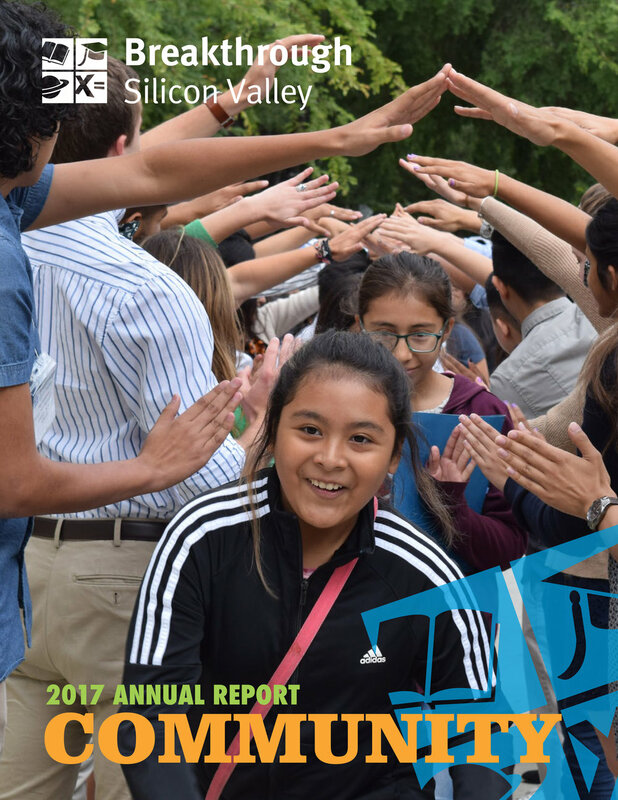 Read about what Breakthrough Silicon Valley has been up to during the 2017-18 school year thanks to the generosity of our supporters. Read about the impact your generous contribution had on Breakthrough Silicon Valley students and programs during the first half of 2017. Read messages from Board Chair, Greg Murphy, plus updates on our college counseling program, student and alumni stories, financial results, and more. Learn about Breakthrough Silicon Valley initiatives and results. Past issues are available on request via email: info@breakthroughsv.org. For the first time ever, in 2016, SCU hosted Breakthrough’s summer program, allowing us the exciting opportunity to operate on a college campus. For kids who face tremendous obstacles every day, this means the chance for college dreams to take root. Read our first annual report ever published. Featuring inspiring stories from Breakthrough alumni and families, who share the impact of their experiences. See our metrics and how we achieve such great results. Finally, hear from community partners about why they believe in the power of our mission. Over the next few years, Breakthrough Silicon Valley will focus on strengthening existing programs, hiring and retaining talented staff, securing long-term sustainability, and making appropriate adjustments to programming to best serve our increasing enrollment.